Oracle is not first in BI, and wants to change that – that was the clear message of a well executed, multi-site “real plus virtual” event with top executives showing off the result of a multi-year effort to rationalize and integrate a set of leading but overlapping components into a seamless suite. Oracle Business Intelligence Enterprise Edition 11g (OBIEE) deserves the accolades it has already received from analysts who welcomed its announcement – it makes bold and serious bets on effective centralized metadata administration, data integration/ unification and optimized analytic architecture, collaboration, globalization, mobile device support, and a powerful link to action that will be most effective (unsurprisingly) with its own business applications. While it misses some pieces – fully integrated in-memory processing, SaaS and cloud support among them – these will be forthcoming, and Oracle is clearly committed to a quicker release cycle now that the thorny internal politics around legacy products seem to be resolved. But its competitive focus may be misdirected; while SAP is still ahead in market share, IBM is the bigger threat in the marketplace. The rollout was powerful. Oracle had analysts to Redwood Shores a week before to give us a detailed preview under embargo – this gave us some time to analyze the themes. As usual, I wanted to see how they took it to market, so I dutifully arose at 2 AM local time and joined a webcast of the London launch. This was exceedingly well done; Oracle had President Charles Phillips in town to lend gravitas (and unfortunately little else but marketing slogans) to the proceedings, and a set of satellite events in Frankfurt, Madrid, Zurich, Amsterdam, and South Africa, each with another executive as local host. Followup events in Paris and New York were also in the mix, along with a 50 city global event series. Once Phillips and the obligatory customer panel were done – and at 2 in the morning the wasted time grated more than usual for this analyst – Thomas Kurian stepped up as master of ceremonies, and fulfilled that role to a fault. He set things up, provided context, and reviewed what each meant when it concluded in masterful fashion. Side note: it was quite interesting to be swimming in the tweetstream at that hour, joined by Ray Wang of Altimeter and Mark Smith of Ventana Research as the only other insomniacs from the US. The traffic was a bit different than usual, but still rich, and local tweeting attendees (fewer than we see for North American events) provided on the ground audience reaction. Some industry observers put Oracle well back in the BI pack – Forrester’s Boris Evelson among them, though he acknowledges that he’s seeing more interest from clients in the past year or two. When I was at Forrester, I often found that rankings based on inquiry traffic, restricted as they are to paying clients, often failed to match the broader primary research surveys we did that were not confined to that population. It’s a challenge for analysts to weight the statistically rigorous rankings more heavily, when talking to clients every day can drown out the data. Only one or two such large surveys are conducted a year. To his credit, Boris does a good job ensuring that he has the freshest data he can, and maintains perspective. Total 9,321.9 100.0 8,946.9 100.0 4. Oracle has a way to go to catch Business Objects, but it maintains a reasonable over IBM, and although its messaging at the launch was much more focused on an SAP competition, the real slugfest is likely to be with the well-funded, aggressive IBM BAO initiative. SAP’s focus and messaging around analytics are nowhere near as pervasive and aggressive, and the work Oracle does to compete with IBM will be equally effective in blunting and counteracting SAP’s efforts – especially as it works through its Sybase acquisition, which will no doubt command a great deal of management attention. Oracle has made many acquisitions, major (Siebel, Hyperion) and minor (HyperRoll, GoldenGate, Tacit and many others), that relate to BI. It had its own products like Reporter and Discoverer, and pieces from application acquisitions, like PeopleSoft EPM, all of which had constituencies, revenue and internal supporters. Former Oracle employees will tell you that the process of sorting out a strategy within the company’s meritocratic and political culture can best be described as Darwinian. But it does have an end; the launch of OBIEE 11g made it clear that the major decisions are done. 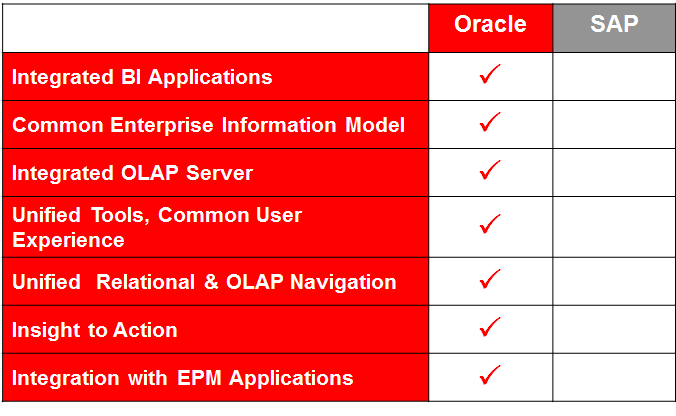 Siebel BI Server, BI Publisher and Oracle Answers, Essbase as a MOLAP add-on, TimesTen as the in-memory future – these are the core strategic components going forward. As Evelson said in his post, “all other Hyperion and PeopleSoft BI products are now in lifetime support mode only.” Some of the newer products are not yet well represented, but they point to the future and make some of the remaining directions very clear. During the analyst discussion, Thomas Kurian shared that BI sales was the largest single growth area planned for sales reps (quota-carrying people). Hundreds (exact number under NDA) salespeople are already trained – Oracle has delivered 24 days of training and has 38 more webcasts planned . The management team has a series of quarterly plays the field will be measured on – cross-selling to the existing applications base, new Essbase sales into the SAP market,with specific target companies named, and a campaign around the Hyperion base. The partner ecosystem has doubled since the Hyperion acquisition, we were told – and there is a focus on global integrators shifting their investment from SAP to Oracle – CapGemini was cited as a recent example. There is a thrust to drive retraining their SAP people on Oracle products. There is strong interest from CSC in telecom, and others in verticals specific to their practices. Gregg Mondavi, Group VP for BI Sales made it clear the company is already in high gear preparing for the 11g push. BI participation in Unlimited License Agreement deals (ULAs) is up 40%, he said. (Follow the link for an independent view of ULAs worth reading.) Mondavi was particularly pleased with the performance of Essbase in a retail account I can’t name here – out performing IBM’s TM1 in a key PoC. And Nick Whitehead, Sr. Director, Business Development, BI Solutions EMEA, cited a key win over SAP at a leading infrastructure and construction company in Spain, an SAP shop with no other Oracle in-house. The overall message was “we’re ready, and we’re taking SAP on.” And that’s good for Oracle; it will do fine. But the focus needs to be on IBM as well. As the chart shows, Oracle has built its usual “us versus them” story with Walldorf in mind, but as a global presence, with an “open, integrated” message, with a strong sales force and partner network that has vertical expertise, IBM is the bigger threat. Oracle needs to look over its shoulder and notice that someone is coming. Disclosures: Oracle, SAP and IBM are clients of IT Market Strategy. Oracle is not first in BI, and wants to change that – that was the clear message of a well executed, multi-site “real plus virtual” event with top executives showing off the result of a multi-year effort to rationalize and integrate a set of leading but overlapping components into a seamless suite. Oracle Business Intelligence Enterprise Edition 11g (OBIEE) deserves the accolades it has already received from analysts who welcomed its announcement – it makes bold and serious bets on effective centralized metadata administration, data unification and optimized analytic architecture, collaboration, globalization, mobile device support, and a powerful link to action that will be most effective (unsurprisingly) with its own business applications. While it misses some pieces – fully integrated in-memory processing, SaaS and cloud support among them – these will be forthcoming, and Oracle is clearly committed to a quicker release cycle now that the thorny internal politics around legacy products seem to be resolved. 6 Responses to Oracle Sets Sights on BI Leadership. Has it Picked the Right Target? Thank you for this very post. It is note only insightful, but also inspiring for further comments. I completely agree with the headline question from the title and eluded response. I would add also that attacking head to head SAP installed base through OBIEE seem to me challenging for Oracle ; Oracle EPM is a better troyan horse for that, I would say. Unless Oracle has a plan to include SAP Applications model in his Common Enterprise Information Model, but I wouldn’t expect this to come. On the technology side, I fully agree that Oracle did a good job on clarifying and delivering on its integration roadmap, although my perception is that this announcement was more about integration than about innovation (and by the way, from the innovation perspective, Oracle had more to say with their newly shipped EPM suite, with the shipment of brand new apps, not only key improvement within Hyperion Planning and HFM ). – Analytical databases : with Timesten, Essbase, Hyperroll and Exadata, Oracle has building blocks to compete in this hot market, but roadmap is still unclear. As a result of the roadmap, some current product may become core, other go to lifetime support, and some of them would need to embrace more natively the common enterprise information layer. – Enterprise Metadata : Common Enterprise Information Layer is indeed a key building block. However, I feel it should go beyond BI, and in this area be accessible in update mode not only by IT : business ask more and more for control over the metadata, eg to edit definition, get information traceability and data lineage, or build “ad-hoc data marts” from self sourced data that they get from the data warehouse, external sources or departmental or personal sources. As a result, I feel the metadata layer should cover not only downstream, but also upstream, were information is created. This is also needed to close the loop between decision and actions while this layer has to embrace EPM more natively. I understand that those topics were covered by Oracle during the analyst briefing under NDA, but they were not during the public launch. I feel Oracle has to clarify to really use this Enterprise layer as a competitive advantage. Hope Oracle Open World will do. One last comment about Oracle attack to SAP. It is interesting to note that Oracle uses terms like integration, unification, integrated applications… Those used to be the SAP fans typical vocabulary. The irony is that while SAP is talking about in memory databases, new analytic appliance or self service analysis tool, they are moving away from their classical “all in one” messages. Now, there is a strong need for clarification from the SAP side , and for that I feel they need to take advantage of the upcoming Sybase post merger period and the shipment of the new release of their BI platform with a brand new meta data layer. Thank you, J-M. Though I didn’t say so, OBI is presented within a context of EPM most of the time. But it depends on who is talking – EPM is an application-centered view that is layered above infrastructure; BI is correctly seen as serving to enable EPM. I admitted to my prejudice that BI is important enough, and pervasive enough in the infrastructure, to get its own focus – but I also point out that Oracle still positions it with EPM, even where it is listed on the home page. So your point of view seems to match up with Oracle’s. As for the ADBMS question, the BI strategy is agnostic and rightly so: it acts to make the question of “which platform” irrelevant via the CEIM. And apologies if did not accurately enough describe how the latter handles external data – I have a deeper dive post coming. The fact is that if content is registered in the CEIM for use (so the BI Server brings it to the tools) the definition you seek has been done. This is no small matter and I need to dig in further to understand how much of a challenge it will be in deployment – but as designed it does what you seem to want it to.